The Dock Street Dig is an archaeological survey and excavation along the former site of Dock Street with artist/architect Matthias Neumann and archaeologist Scott Schwartz. Dock Street is an evanescent monument to the American idea as manifest in its built environment. Mapped out in Dripp’s map of 1853 as part of the Long Island City grid, Dock Street ended up just off Bennets Point in the East River in order to square out the geometry of the shoreline as manifest destiny of the LIC industrial development. 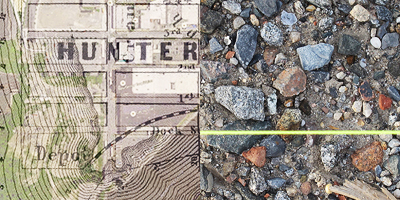 In 1909, with the shoreline adjusted to the orthogonal grid, the street runs through and along the New York Sugar Refinery as part of Havemeyer’s Sugar Trust, only to be buried in a contradicting topography cutting perpendicular through a manmade valley in the subsequent century. Participation in this dig is limited. If interested in being a part of the archaeological team, please send an email to mneumann@normaldesign.com.